Tue, Apr 23, 2019, 2:03:43 ---- The fact: 42.844.000 visitors done. BorusanMannesmann: On-line orders and inquiries BorusanMannesmann Boru Yatirim A.S.
Borusan Mannesman Boru, a leader of steel pipe manufacturing in Europe, is now connected online to the world pipe industry via its Internet web site - www.borusanmannesmann.com. Enjoying the broadest range of products offered all over the world, Borusan Mannesmann Boru has the largest pipe web site in the world with a strong, dynamic infrastructure. In addition to general and technical information, the web site contains e-Business applications. Members can use their personal pages to send price inquiries, perform negotiations, and place bids. Finally, customers can place online orders and conclude sales contracts that are automatically drawn up by the system. Borusan Mannesmann sales department directs offers and bids to the responsible sales persons. Customer responses and sales contracts are generated within the same application. Having reached an agreement on sales terms, customers can place their orders by using their "ordering number" given by Borusan Mannesman Boru sales representatives. After all the details of the order are transferred to the system and the order is finally approved by Borusan Mannesmann Boru, an online sales contract is prepared. Upon the signing of the contract by the parties the order is finalized and put into process. Online price quote requests and online bids are processed by the "Borusan Mannesmann Price Inquiry&Order System". With a production capacity of 650,000 tons a year, Borusan Mannesmann Boru manufactures longitudinally welded (ERW) pipes in diameters ranging from 3/8 inch to 12 inches as well as spirally welded (SAW) pipes in diameters ranging from 8 inches to 100 inches. 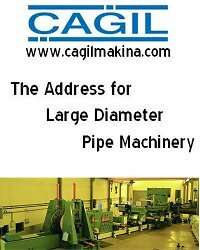 The company's product range includes general purpose pipes, boiler tubes, natural gas pipes, precision and special tubes, hollow sections, water, petroleum and natural gas transmission pipes and coated pipes with epoxy, bitumen, polyethylene and cement.